The other night I was at Barbara Jo’s Books for Cooks at an event (my own wife’s book launch event actually) and a friend was looking for a couple books to buy. 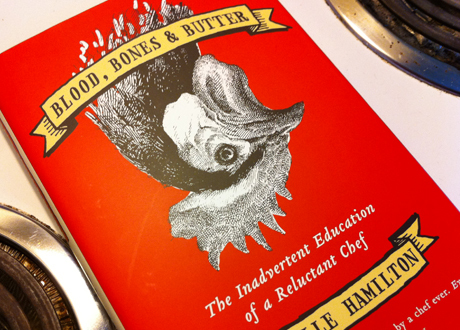 My recommendation: Blood, Bones and Butter: The Inadvertent Education of a Reluctant Chef by Gabrielle Hamilton. Now, I can’t say I reach for biographies as a first choice when looking for a book, though it seems when I do, it’s often food related. Julie Child’s My Life in France, Bulford’s Heat, Bourdain’s Kitchen Confidential, etc. Not that there’s anything wrong with that. Yet, chefs do not always make the best writers (and vice versa). However, in this case, Gabrielle Hamilton has come into her writing success honestly, and in much the same way as her cooking; with grit, determination, raw talent and a dose of luck. This is non-fiction that reads like fiction. If Anthony Bourdain had prose skills like this, Kitchen Confidential would have been an even greater success (if that’s possible). Actually, there are promotional quotes from Bourdain and a Batali that don’t mask their admiration for Gabrielle’s writing. It’s like chefs jealously marvelling at another’s glorious culinary achievement all the while devising how to steal the recipe, or reverse engineer it. Hamilton’s life, if not exactly jealously inducing, sure makes for a good story. If you know anything about her, you’ll already know how some of it turns out while reading. In fact, reading through her early teens through mid 20s is compelling simply because you can’t wait to find out how she managed to navigate out of a life destined to be quite a lot less extraordinary. If you’re looking for long, loving stories about food, go read Molly Wizenburg’s A Homemade Life instead. If you want to marvel at a raw, honest and rocky account of a chef’s deeply emotional and fraught ascent with food as a rooting force, then grab this. In fact, it’s just the reason this is such a compelling book—you’ll have to keep reminding yourself this is someone’s real life story (well, the first half of it anyway). And, if you’re the type to judge a book by it’s cover, then this ibook won’t disappoint either way. I love this book so much that I’m trying my best not to read it too quickly!